�Another opening of Another (Fiona Sargeant) Show� - and what a show! This was the biggest and best celebration yet of our home-grown dancers, Siphe, Thuthu and Aviwe, mixed with the discovery of some awesome local talent, some of whom revelled for the very first time in the roar of the crowd and the smell of the grease-paint (or is it the other way round?). When the three young men from Zolani and the five ballerinas combined Western ballet with a truly African rhythm - and the audience on its feet and joining in - it was unforgettable, a WOW! moment and a magical meeting of cultures. When Thuthu and Aviwe delighted the audience with the news that they will be off to dance in Washington DC in July, the audience clapped and cheered at their achievement against the odds - there were surely several tears in many eyes. The Primary School Hall was packed, the all-you-can-eat buffet (prepared or donated by a host of volunteers) was more than sufficient to feed the 180 guests, the bar was well stocked and skilfully manned and yet more volunteers did the washing up. Generous donors kept Montagu�s resident auctioneer busy as he emptied our wallets with his usual charm. The event raised an incredible 25,000 Rand. 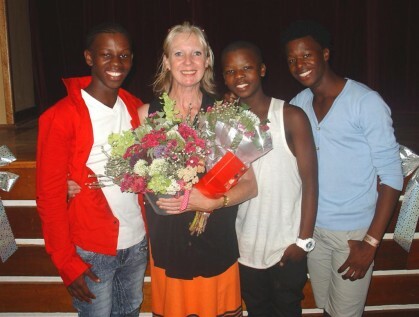 This will help to ensure that Thuthu and Aviwe can finish their studies at the Cape Town School of Performing Arts. What is it about our small town, that it will support these young people with such enthusiasm and generosity? Many African languages have a term for the power of communities working together: "Ubuntu"
In Malawi they say � �your neighbor's child is your own, his/her success is your success too�. That�s exactly how we all felt at the end of the show.